ARLINGTON, Texas (AP) — Cleveland Indians rookie shortstop Eric Stamets has tried to approach this spring training like any other even though he’ll start the season opener Thursday with three-time All-Star Francisco Lindor on the injured list because of a calf strain. 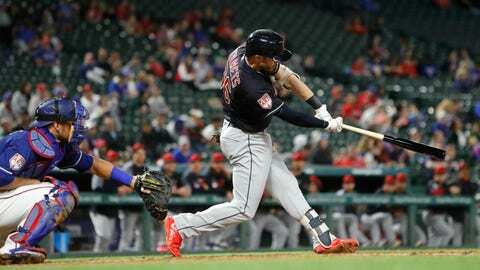 Stamets hit a grand slam in the fourth inning, his first home run of the spring, and the Indians beat the Texas Rangers 10-1 on Monday night. “If my name’s up in the lineup, then I’m going to play,” said Stamets, who went 2 for 4 and is hitting .250 with one spring training game left. “If it’s not, then I’ll just do my best to do my role as a teammate. Kevin Plawecki added a two-run homer in the ninth, and Greg Allen had a bases-loaded triple in the eighth. Carlos Carrasco allowed one run and five hits in 5 2/3 innings for Cleveland. He struck out four, walked one and hit two batters with pitches. Ronald Guzman hit his team-leading fifth homer of the spring for Texas. Rangers starter Edinson Volquez, who missed last season following Tommy John surgery, gave up four runs and five hits in 3 1/3 innings. He walked three and plunked one batter with a pitch. Before the game, the lineup cards were exchanged by Rangers bench coach Don Wakamatsu and his son, Indians minor league shortstop Luke Wakamatsu. Luke played the final four innings and singled in his only at-bat and scored. “It was a once-in-a-lifetime experience,” said Luke Wakamatsu, who graduated from nearby Keller High. RHP Zach McAllister, signed to a $1 million non-guaranteed contract in January, was placed on unconditional release waivers. … RHPs Matt Bush and Rafael Montero were assigned to minor league camp to continue rehabilitation from offseason surgery. Indians RHP Mike Clevinger will close out the two exhibition games at Texas with his fourth spring start. In 13 2/3 innings, Clevinger has allowed 13 hits, struck out 16 and walked six. Rangers LHP Drew Smyly has pitched 9 1/3 innings in four spring starts after being limited by a March 2017 elbow injury to one minor league appearance during the past two years.